I rarely polish my nails and when I do, I invest in a professional manicure. My nails are short and usually bend into the quick, which causes them to break. Polish never lasts very long on my nails because of the numerous times I wash my hands and all of the things I do with my hands. 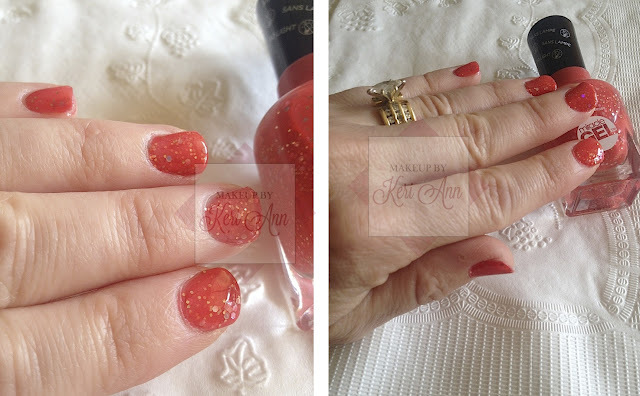 I have inquired about the gel polish at the salon, but more than one technician has warned me that the gel polish is not good for your nails. While volunteering one day this summer, I complimented a co-worker on her nail polish. She said it was the longest lasting polish she's used. She was so thrilled with her polish, I decided to purchase a bottle and see what I thought. Sally Hansen's Miracle Gel Nail Polish is a 2 step system. 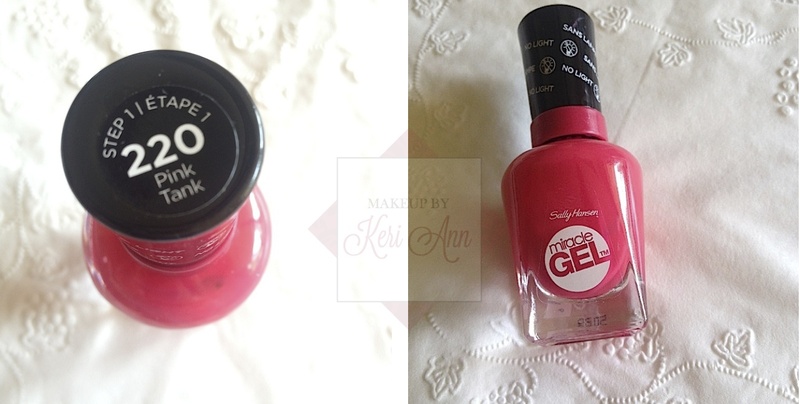 The first step is the Sally Hansen Miracle Gel nail color and the second step is the Sally Hansen Miracle Gel Top Coat. Now the product claims the polish can last up to 14 days, so I decided to take notes about the results. 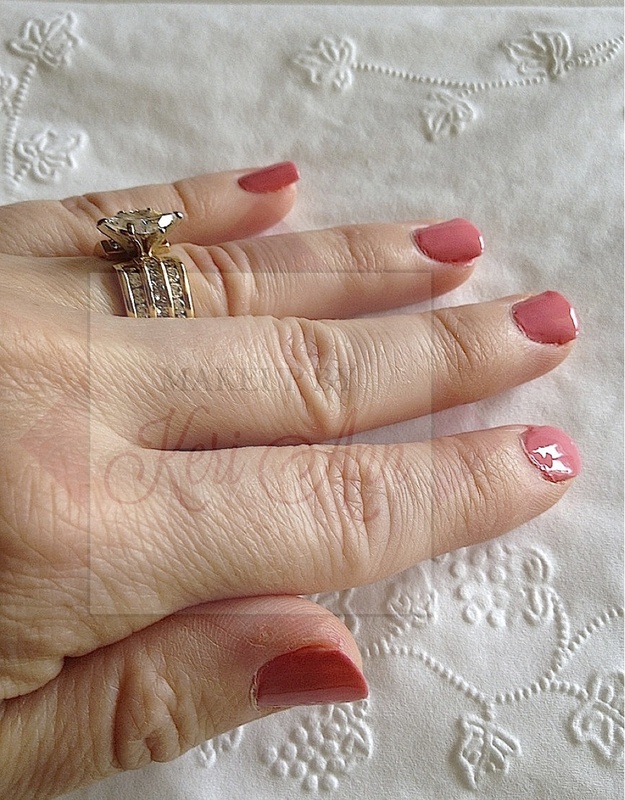 I chose Sally Hansen Color 190 - Pinky Rings. 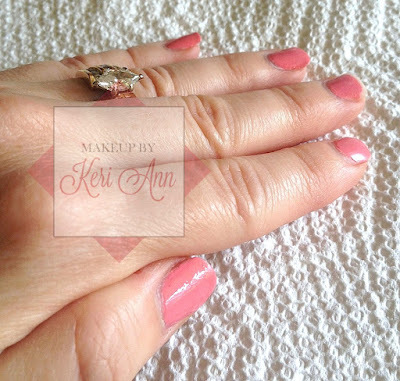 The nail polish does not require a base coat. According to what I read, the color actually binds to the top coat. The product "cures" when exposed to natural light. I loved the color and the finish. This product dried within minutes and it looked like a professional manicure!!! This was July 9, 2015. A few hours after polishing, I noticed a tiny chip in the polish. I must have done something before the polish was dry. By July 11, several nails were chipped, so I decided I needed to try again. My fellow volunteer told me the success of the product was getting the correct thickness/amount of top coat. By 07/18, the nails on both hands were dull and had tiny surface cracks. The index and middle finger nails on the right hand were chipped. 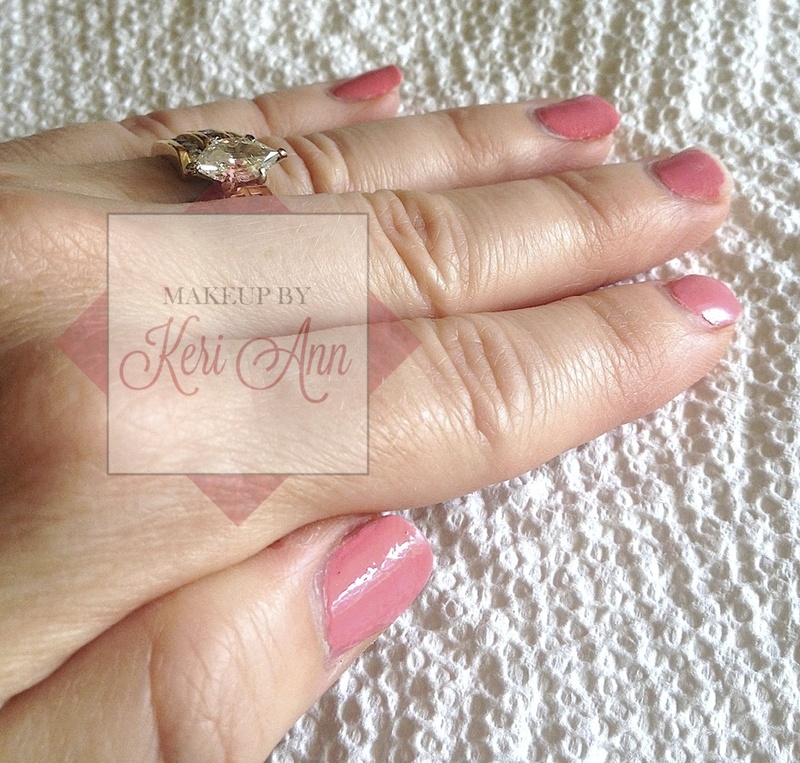 On July 19, I began getting chips on the nails of the left hand. 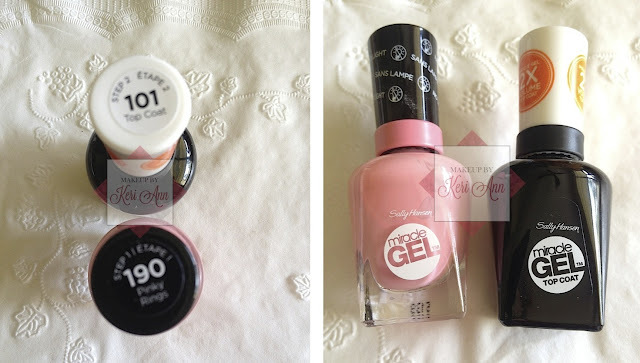 However, this is probably the longest amount of time I have kept polish on my fingers, so I decided to to try a new color, Sally Hansen 220 - Pink Tank, and even thicker top coat…. By July 22, I was beginning to see some chips but on July 26, I had to take the polish off because it looked so bad. When I went to remove the nail polish, I noticed a slight tinge of nail staining, but not anything like I would normally see/expect from such a bright nail color. 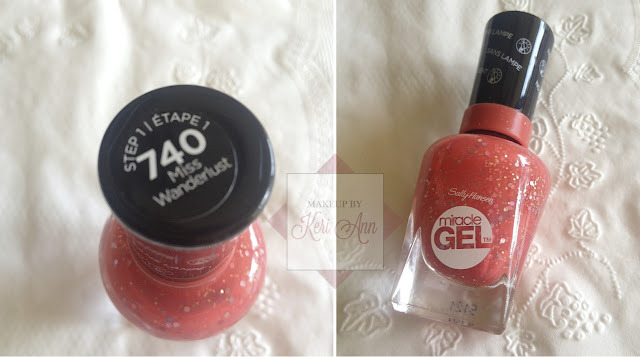 On July 28, I decided to try Sally Hansen Miracle Gel Nail Color 740 - Miss Wanderlust. This nail color is a vibrant orange with glitter in it. I've never used a glitter nail color before, so I am anxious to see how it will last…. This was a fun and beautiful polish, but painting it on with the glitter, was a bit challenging. My polish lasted a good 3-4 days, but there some were flaws with my polish and it seemed to chip easily. I started picking on the polish (it is really hard for me not to pick my nail color off when it chips). I am not sure if I can blame it on the glitter polish, or if it was a result of several weeks of wearing the gel polish, but the surface of my nails were a mess. I don't have great nails, as I mentioned in the beginning, but I've not had peeling nails like that in quite some time and the only real difference was the glitter polish. 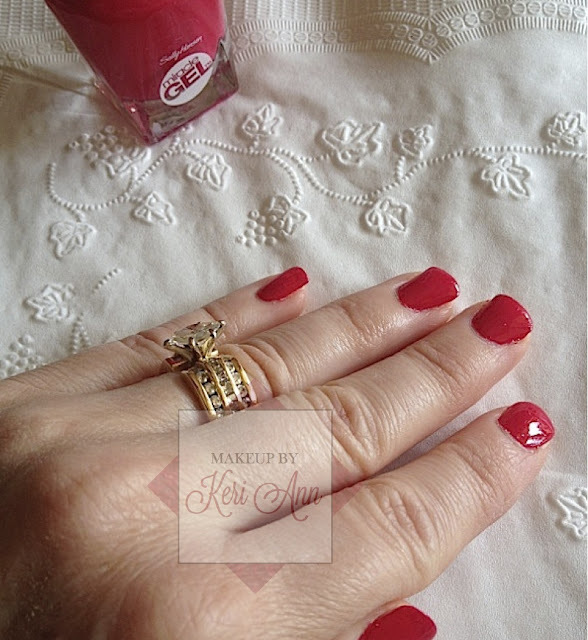 Over all, I have loved the Sally Hansen Miracle Gel Polish. It has lasted longer than any other nail color I've used. If I use the Miss Wanderlust color again, I will probably use a regular polish coat underneath it (probably Pinky Rings) and then apply the glitter polish as the second coat before applying the Sally Hansen Miracle Gel Top Coat. If you've used this nail color, I'd love to hear about your results!